Neutralization reaction, 3 of 4. 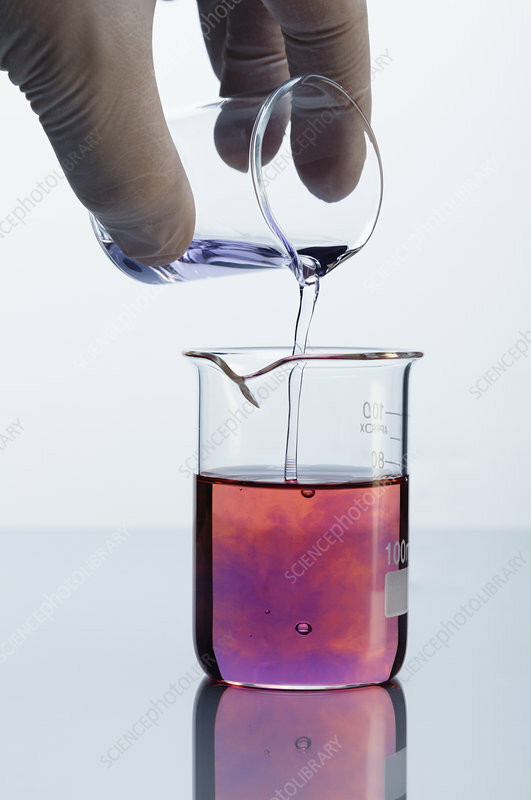 Gloved hand pours sodium hydroxide (NaOH) into a beaker containing hydrochloric acid (HCl). The reaction is: NaOH + HCl -> H2O + NaCl. Both solutions are 0.1 M concentration and have few drops of universal indicator added. Initially, the acidic solution remains red because base is neutralized but acid is in excess. Then some blue regions in the mixture become more apparent and prominent, indicating that in those regions some base has not reacted. Finally, when the base is added in excess, the whole solution becomes blue, indicating a basic resulting solution.